When Mickie Sienna almost burns his house down, his grown children start looking into nursing homes. But his youngest son, Jesse, surprises them all by offering to have Mickie move in with him. Jesse has spent his whole life as the "baby" of the family and is ready to finally get to know his father the way his older siblings do. 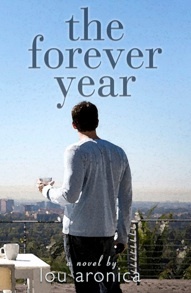 In The Forever Year, Lou Aronica presents a story not only of the challenges a father and son face while getting used to living with each other again, but also a much deeper story of love that never ends. Jesse is in a very comfortable relationship with Marina. They are both enjoying their time together, but they're also realists. They know that love always dies, so they haven't taken that final step to full commitment. But Mickie can't understand how his son can take a chance on losing the perfect woman for him. So Mickie decides to tell Jesse his own love story. He opens up about the woman who stole his heart as a young man, and hopes that Jesse will see how much love matters. But all Jesse can see is that the relationship obviously failed ~ after all, the woman Mickie speaks of isn't Jesse's mother! Will Mickie have the strength to finish the story and reveal the true message before Jesse ruins what he has with Marina? I really enjoyed The Forever Year. It was a wonderful story of relationships ~ both between father and son, and between man and woman. Aronica switches back and forth between Mickie's voice and Jesse's voice throughout the story, so we can hear their personal thoughts and feelings about what is happening. Mickie's sections at times alternate between current time and the love story that he is telling Jesse. While this may sound complicated, it's quite smooth and easy to follow. If you enjoy heartwarming stories about family and relationships, particularly love stories, I highly recommend The Forever Year by Lou Aronica. This review was written based on a copy of The Forever Year that I received from the author in exchange for an honest review. Oh, this really sounds great, Julie. Thanks for the review! Thanks for the terrific review, Julie. Much appreciated.